Just a day before the Grace Cottage Hospital 5K walk/run, and a week before the Southern Vermont Girls on the Run 5K, former Boston Marathon champion Amby Burfoot is speaking on Friday, May 10th from 5:30 – 6:30pm, at the Brooks Memorial Library in Brattleboro. Burfoot won the 1968 Boston Marathon and hasn’t stopped running since. 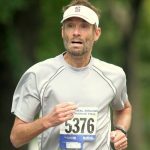 He served as longtime editor-in-chief of Runner’s World magazine, authored several books on running (and life), and is an inspirational mentor and coach to many. Burfoot’s talk will focus on two subjects. The first is a brief history of some of the most influential female runners throughout history. These are the “rebels, rule breakers, and visionaries who changed the sport forever.” A second theme is based on his latest book Run Forever. This portion of the lecture will focus on lifetime running for health, fitness, and happiness. Autographed books will be available for purchase. The May 10th event will be held in the Community Meeting Room on the second floor of the Brooks Memorial Library at 224 Main Street in Brattleboro. The event is free and open to the public. Refreshments will be served. No registration is required. Runners can also meet Amby at the 10th Annual Grace Cottage Spring into Health 5K on Saturday, May 11th in Townshend. The special guest will have autographed books available for sale and will be happy to talk to runners after the race. For more information, call 365-9109 or visit www.gracecottage.org/events.